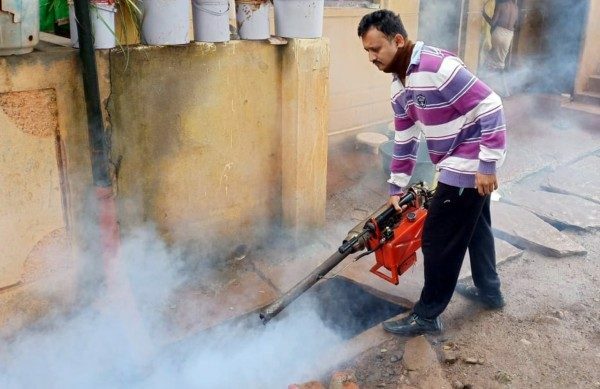 The cases of Dengue, Malaria have been on the rise and even after asking the Corporation for fogging to be done in his ward and with a reason of dearth of manpower from the Corporation, Dr Dinesh Nashipudi corporator of Ward No.52 himself borrowed the fogging machine and chemicals and has been fogging the area himself for the past 4 days. He being a Doctor he is aware of the precautions one needs to take and hence has been fogging in his ward. Nashipudi has almost completed fogging in 90 per cent area of his ward and the remaining 10 per cent area was delayed due to heavy rains since last two days. For the residents of ward No. 52, it is not new for them to watch to watch their corporator himself moving around fogging in the gutters and the bushes. Dr.Nashipudi has also bought a new grass cutting machine which he intends to use to clear the bushes and grass in his area which are also breeding grounds of insects. There are many open plots in the area and hence this machine will help in cleaning the space. Let your Work make the noise and not your mouth. you are the example for this, Good job sir. Expect our other corporate members elect you as a Mayor in the coming days. We need to elect one member and then that member goes and vote for which member we don’t know. We need some change in our constitutional, where we can elect direct members. Brilliant work Bro. Carry on the good work. You are an awesome example to be followed!Hope some of those fools will wake up and follow your lead to have Dengue, Malaria under control to save lives by means of creating better environment and better future for our beloved city of Belgavi and surrounding areas. Congratulations on taking the task on your own hands! Nashipudies work is apriciated, Other should learn from him.